On a trade visit to Malta, Orfeo – in line to the throne of Pylos – is kidnapped by mysterious strangers. The net is spread far and wide, with heroes from all over the Aegean joining forces in the quest to find the lost prince. Is Orfeo in danger, though? His captors seem to have strange motives, what exactly do they see him as? A prince, a prophet, a political pawn, or something more? Only one thing is for certain, nothing is as it appears on the surface, and Orfeo must keep his wits about him. This wonderful work of historical fiction will amaze and engage you in equal measures. With The Wanderer’s Last Journey, Murray Lee Eiland Jr. has woven an astounding and complex tapestry. It has all the makings of a classic fantasy epic, as the rich and evocative world he creates is as intriguing as it is intricate, whilst the narrative constantly keeps us on our toes. Eiland Jr. clearly has an eye for important details, as his simple use of language is restrained and mannered. He writes much like any of the great classical fantasy writers, with simplistic, well-constructed sentences forming the framework for a complex and sprawling narrative. Where he does choose to go into detailed description, he paints for us a clear and colourful picture. The milieu of The Wanderer’s Last Journey, whilst mostly serving as a stage on which to set the players, is perhaps one if the novel’s most astonishing features. This mythical, magical Mediterranean is exotic and enticing, and we are left wanting to learn more about it. As the story expands and speeds towards its thrilling crescendo, its setting is left unexpanded, and one wonder’s whether the novel might have benefited from going into greater detail in this regard. In many ways it is unfamiliar from the Ancient Greece we know and are familiar with, yet it verges upon Virgil and Homer. The Iliad is an obvious reference, and Eiland Jr.’s love of this period is clear on the page. This novel sets Eiland Jr out as an author of great scope and intention, however one who isn’t afraid to create a world of great depth and complexities. He cleverly weaves multiple storylines and, for the most part, manages to keep on top of this, and keeps all the strands of his stories working together. There are moments, though, where the machinations of the plot seem to get the better of him. The action tends to flit between one character’s perspective and another’s, and whilst this serves to provide us with a huge wealth of storyline, it occasionally distracts from it. It also means, at points, that we aren’t given long enough in each character’s story to form an emotional bond with them, and we are left wondering who exactly our protagonist is. 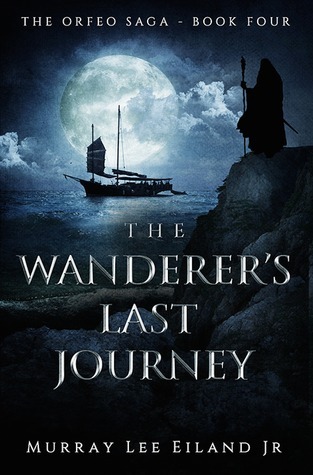 This is perhaps to be expected, though, with a story so vast, and one with so many strands, and for the most part The Wanderer’s Last Journey works well as a rich, entertaining fantasy epic.